Obtain the taxpayer's acceptance of the audit results. This does not mean that the taxpayer must agree with the audit results. Any adjustments noted and the applicable law or rulings involved - if not already given, then at this time copies of rulings and properly edited microfiche that support the audit adjustments can be given to the taxpayer. The exit conference should not produce any 'surprises' for the taxpayer. The taxpayer and/or the authorized representative should be, by the time of the exit conference, aware of the types of audit adjustments made. The mechanics of the audit - this will include any calculations or projections as well as the information available to the taxpayer on the auditor's detailed schedules. If not done already, then at this time, the taxpayer will be given copies of all final audit exams. Promoting future tax compliance is one of the main goals of the Comptroller. During an audit the auditor has an opportunity and responsibility to help educate the taxpayer. The auditor can make recommendations on proper reporting methods; however the auditor should not attempt to set up or redesign the taxpayer's accounting system. All exceptions noted during the audit field work, regardless of whether or not an adjustment was made, should be discussed so that the exceptions can be corrected before they become significant errors in the future. The taxpayer should be aware that tax laws evolve and change and that it is the taxpayer's responsibility to keep abreast of these changes. The Comptroller publishes brochures for regular mailings and is available for assistance. The taxpayer is informed in all audit letters that the audit does not serve as an approval of the business's tax reporting system. The letters further state that the taxpayer will be held accountable for all future taxes owing and due. The auditor will collect audit deficiencies in the field whenever possible. This attempt at collection is made regardless of agreement. The taxpayer may disagree yet pay the audit in order to stop interest from continuing to accrue in the event that his contentions are not upheld. The taxpayer should be made aware that interest will continue to accrue on any unpaid portion of the tax deficiency while the auditor writes up the audit and the audit is being processed. Both of these reports are listed by audit office and are maintained for approximately 14 days. The auditor may print out the Audit Adjustment Report from the Comptroller web site and presented to the taxpayer or taxpayer's authorized representative. Or, the report can be downloaded onto the auditor's computer and emailed to the taxpayer. Some examples of pages contained in an Audit Adjustment Report and accompanying printouts follow. This printout serves as a cover page and lists the statute of limitations for the audit. This printout is the first page of the Audit Adjustment Report. The above two printouts comprise the Audit Adjustment Report which lists the tax, penalty, and interest on a period by period basis, and then totals the amounts. The amounts listed consist of all taxing jurisdictions which had adjustments in the audit. The above is Page 1 of the TAX BASES USED FOR CALCULATIONS. The prior two printouts consist of the Tax Bases Used for Calculations. These are the amounts of tax on which penalty and or interest were computed. This printout lists the various taxing jurisdictions which had audit tax adjustments. In the above example, adjustments were made to the State of Texas, Tyler City, and Smith County. Note that all of the above printouts have the statement: 'DRAFT: ALL AMOUNTS ARE PRELIMINARY AND SUBJECT TO FINAL REVIEW.' The amounts on the Audit Adjustment Report at the exit conference are not final as changes may be made to the audit during the review process at the Regional Processing Center. Due to these changes, additional monies may be due when the taxpayer receives the official Notification of Tax Due. The auditor must complete various forms when a collection is made on an audit. If the necessary form is not completed correctly, interest will continue to accrue. The auditor should make the best possible effort to apply payments correctly. An audit has been performed on ABC Services, Inc. and a deficiency of $101,511.89 has been estimated and paid. This example assumes a single detailed exam. Multiple exams would need to be combined and sample exams would need to be estimated prior to allocation computation. The taxpayer has made payment of the tax estimate to stop any additional accrual of interest. The auditor allocates the payment based on the tax rates for state, city, county/SPD and MTA/CTD authorities. The amounts entered on the payment form must equal the amounts on the check. Exhibit III is a completed payment form. T Code 26040 is checked for sales & use tax, T Code 13040 for franchise tax, and T Code *XX040 for all other taxes and fees. *The first two numbers of this T Code consist of the Tax Code number. 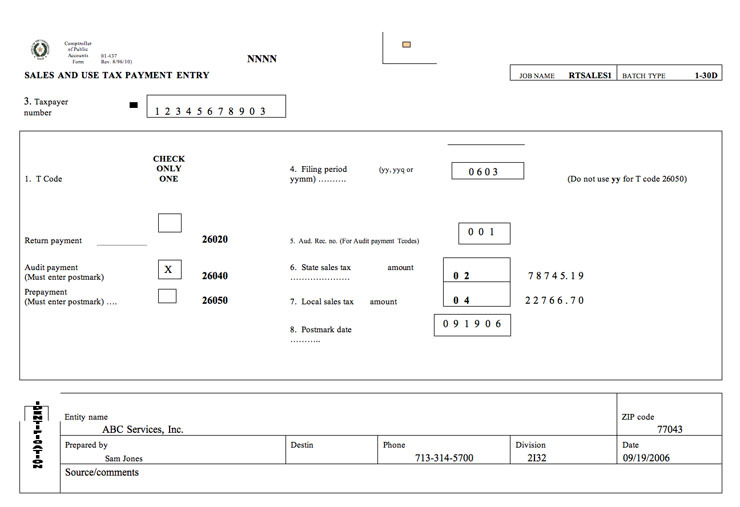 For example, the T Code for an audit payment for a motor vehicle seller-finance would be 78040 on Form # 00-493 (Rev. 9-03/11). The filing period will be the last period of the audit. YYMM (year/month) if the taxpayer filed monthly, YYQ (year/quarter) if the taxpayer filed quarterly, and YY0 if the taxpayer filed yearly. The postmark date will be the date the check is given to the auditor if it is not mailed in. All payments should be processed to headquarters within 24 hours of receipt. As a matter of Audit Policy, auditors do not accept cash payments. Any taxpayer that attempts to pay in cash must be asked to convert the cash into a form of a check. If the taxpayer insists on paying by cash, the taxpayer needs to be directed to the nearest Enforcement Office. If the taxpayer pays less than the amount due on a sales & use tax audit, the payment should be split in the ratio of approximately 80% State tax and 20% Local taxes. This is due to the fact that when the payment is entered into AWM, the system automatically splits the payment 80%/20%. Auditors should advise taxpayers who cannot pay an audit to contact the Enforcement Office in their area to discuss payment options. Payment plans are an Enforcement Division function and not a function of Audit Division. When collection problems are expected, the auditor will complete the collection portion of the Audit Plan. A copy should be sent to the appropriate Enforcement office. This information will aid in collection efforts. If the auditor believes that the state funds are in jeopardy due to insolvency or fraud, a Jeopardy Determination can be requested instead of a regular deficiency judgment. A Jeopardy Determination will allow immediate liens to be filed and gives the taxpayer 20 (rather than 30) days after billing to file for a redetermination hearing. Headquarters approval is needed for a Jeopardy Determination to be issued. This should be noted in the comments section of AWM. After all collection actions are exhausted, the Comptroller has the authority to seize and sell nonexempt real and personal property belonging to delinquent taxpayers. The taxpayers have 15 days after delinquency before a levy is enforced and 20 days to resolve the delinquency before seized assets are liquidated. Taxpayer assets, including bank accounts, can be frozen without notifying the taxpayer. If at the end of an audit there is an overall credit, the taxpayer will receive a refund. In addition, for all report periods due on or after January 1, 2000, taxpayers have been able to receive credit interest on refunds. The interest begins to accrue 60 days after the date of the payment or the due date of the tax report, whichever is later. Credit interest does not accrue for Title 6, Property Code. Credit interest accrues on taxes paid under the International Fuels Tax Agreement (IFTA) effective June 1, 2006. Prior to September 1, 2005, the credit interest rate was one percent over the prime rate published in the Wall Street Journal on the first business day of each calendar year. Credit audits will be refunded once the audit is completed using the interest rate in effect on the start date of the audit. If the entrance conference date is prior to September 1, 2005, the credit interest rate will accrue at the prime rate plus 1 %. If the entrance conference date is on or after September 1, 2005, credit interest accrues at the new rate. A refund will not be issued until all outstanding liabilities with the agency are satisfied. The total refund may be less than estimated if deficiencies occur for some other audit period in the audit. The refund may be offset by penalties and interest associated with these deficiencies. Penalty and interest accrue on audits in the same manner as they are assessed on late returns. Interest is calculated to the date of payment of the audit. In discussing penalty and interest calculation with taxpayers, it is often helpful to use examples from their audit. Take a transaction mid-way through the audit and explain the process. Taxpayer is a quarterly filer, and you pick an adjustment dated 04-12-2006. This item, if reported, would have been reported on the second quarter of 2006 return. The return would have been due July 20, 2006. Up to 10% penalty is assessed during the first 60 days after the due date. Interest would start on September 19, 2006 and accrued at 8.25% a year until paid. In a four year audit, some transactions could have no interest and others will have 20% or more. Remember that any credit periods will affect the interest computation. The taxpayer will receive a billing of taxes, penalty and interest calculated through the date of the billing. The billing will go out to the taxpayer approximately one month after the audit is submitted to review. Audits need to be submitted to the Processing Center at least 45 days prior to the expiration of any statute period. Penalty is assessed on a period by period basis. All periods have a $1 minimum penalty for each tax (state, city, county/SPD, MTA/CTD). Credit penalty is not given for credit periods. As a result, a credit period may reduce the overall audit deficiency, but the penalty remains assessed on those deficiency periods. Tax billed may be higher than estimated if there are mixed credit and deficiency periods as credits are applied to the earliest periods with tax liabilities. Credits are applied on a period by period basis to tax, then penalty, then interest. This causes the overall tax liability to increase as some of the tax credit has been applied to penalties and interest. On the following pages, see an example of penalty and interest calculations titled Audit Adjustment Report. Taxpayers do not have to request penalty and interest waiver. All audits are automatically reviewed for settlement of penalty and interest. Taxpayers should follow procedures outlined in Contesting Disagreed Audits (Publication #96-1253, Revised May 2007). The auditor must complete the Penalty and Interest Waiver Worksheet (located in Comprehensive Audit Tax System (CATS) for any audit which has a period in which penalty may be assessed. This would also include credit audits in which tax is due for certain periods. The information on the worksheet should be as complete and accurate as possible. For audits with penalty of less than $10,000, the audit field manager has the authority to waive or deny the penalty on the audit. If the taxpayer disagrees with the audit field manager's decision, the taxpayer may request a redetermination hearing, even if this is the only unresolved issue in the audit. The audit field office manager may also recommend waiving penalty on late return periods. This must be specifically mentioned on the Penalty and Interest Waiver worksheet that waiver was granted/recommended on late returns. Specific reasons should be given to support this waiver. For audit penalty amounts equal to or less than $10,000, Audit Headquarters must make the decision. The audit field office must complete the Penalty and Interest Waiver Worksheet, including recommendation, and the audit office manager submits the form via email to the appropriate Audit HQ personnel (currently Patrick Ramirez). The audit should not be held at the field office level for the response from Audit HQ. If a response is received from Audit HQ before the audit is sent to the Processing Center, the response should be printed and submitted with the audit package for processing. If a response has not been received from Audit HQ, include the email correspondence with a note to the Processing Center that the Penalty and Interest Waiver Worksheet has been sent via email to Audit HQ. The audit field office manager or designee should sign the hard copy of the worksheet. The following guidelines should be used for deciding penalty waiver. Each case is decided on its own facts. No one factor should be used to the exclusion of other factors, nor do a certain number of requirements need to be met from each list. By the time of the exit conference with the taxpayer or taxpayer's designated representative, the auditor should know whether penalty or interest will be recommended for waiver. The auditor will inform the taxpayer of the initial recommendation; however, it needs to be stressed to the taxpayer that the audit field office manager or Audit Headquarters will make the final decision. The auditor will also inform the taxpayer that even though audit penalty will be waived, it will still be assessed for any periods which were originally filed late. Lastly, the auditor needs to inform the taxpayer that the final decision regarding penalty or interest waiver will be included in the audit cover letter. If the taxpayer disagrees with the decision regarding penalty or interest waiver, then a refund or redetermination hearing may be requested. Occasionally penalty will be waived on only a portion of the audit. Penalty can only be waived on an exam by exam basis, not on individual transactions or dates. A notation should be made in the Comments Section of AWM. A taxpayer has been audited and three distinct types of errors have occurred. The first error was tax collected but not remitted due to a bookkeeper posting incorrect amounts. The second includes errors that are similar to those found in the prior audit. The third was due to a tax law change which was unclear and subject to misinterpretation. According to criteria, only the third error listed is subject to penalty waiver. The waiver should be noted on the Audit Cover Letter and Penalty and Interest Waiver Worksheet. In the audit cover letter to the taxpayer, the 'denied paragraph' will be amended to convey waiver of the exam in question. At every exit conference the taxpayer will be given the Contesting Disagreed Audits brochure (Publication #96-1253, Revised May 2007). This is required regardless of whether the taxpayer agrees or disagrees with the audit and whether the audit is a credit, deficiency or no tax due. The auditor does not need to read or discuss all sections of the brochure, and the depth of discussion depends on the taxpayer's interest and situation. In disagreed audits, every effort should be made to inform the taxpayer of the redetermination process. This brochure gives the taxpayer an overview of the remedies available upon disagreement of an audit. The 'Texas Taxpayer Bill of Rights' has also been included in this brochure. This 'Bill of Rights' states Comptroller policies which have been in effect for years. Most are rooted in common sense and fairness rather than actual legalities. If a taxpayer disagrees with audit results, the auditor should be certain that the taxpayer's objections and disagreements are understood and documented in the Audit Plan. A good number of these disagreed audits can be resolved before entering the hearings process. Disagreements concerning application of tax law are generally harder to resolve prior to hearings because auditors have based decisions on available research. These decisions are not likely to be changed prior to the hearings process since an auditor's supervisor and manager are limited to the same research material. Disagreements concerning audit procedures may be handled in the exit conference, reconciliation conference, and/or dispute resolution conference. These disagreements may reflect a lack of taxpayer input allowed while conducting the audit or a lack of information shared with the taxpayer or the auditor. Through discussion at these conferences, a better understanding of why certain audit procedures were used or why these audit procedures need to be changed may result. Disagreements concerning additional records or documents are handled almost entirely through pre-hearing procedures. The taxpayer is given time to produce the information, it is reviewed and the audit stands or is amended on this basis. Efforts are made to resolve any and all problems before formal hearings are necessary. At the exit conference, the taxpayer should be made aware that a reconciliation conference attended by the auditor's supervisor/manager can be requested. In addition, a conference may be scheduled with an Independent Audit Reviewer (IAR). These conferences frequently result in a resolution of the issue of contention. For more information please refer to the Contesting Disagreed Audits brochure, Publication 96-1253, Revised May 2007. Redetermination and refund requests are both forms of disagreement with the audit. Both are initiated by the taxpayer and require a statement of grounds upon filing. The taxpayer should note all parts of the audit which are disagreed and why. A refund request differs from redetermination in that the audit has been paid. The taxpayer normally has 30 days after receiving the Notice of Tax Due to request a redetermination hearing. If a jeopardy determination has been issued, the taxpayer has 20 days. The taxpayer may request a refund hearing at any time as long as the report periods in contention are within the statute period. If the taxpayer does not request a hearing before the due date on the Notice of Tax Due, the taxpayer must pay the liability and request a refund. Within six months after the deficiency determination (all taxes) becomes final, or within six months after the jeopardy determination (sales tax only) becomes final, whichever is later. 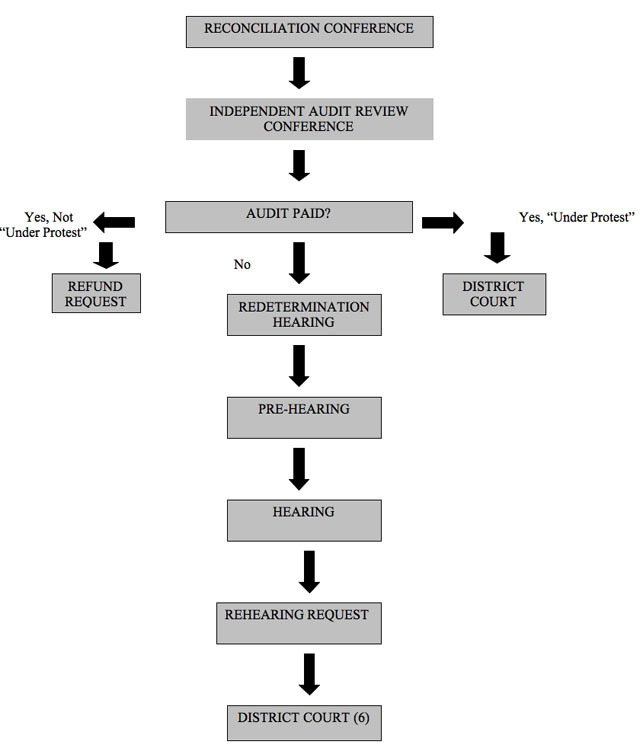 ONCE A REDETERMINATION OR REFUND REQUEST IS MADE, AN AUDIT MAY BE AMENDED TO INCREASE OR DECREASE THE AUDIT RESULTS. After requesting a refund or redetermination hearing, the taxpayer is allowed 60 days to gather additional evidence supporting the stated contentions. The taxpayer will be sent a Sixty-Day Letter from Audit Processing section of Audit Headquarters if certificates are involved and/or a letter requesting any additional documentation within 60 days. See exhibits. The auditor should review any additional documentation on the 61st day. The auditor is required to make arrangements to view this material and can do this in the office or at the taxpayer's place of business. SEND FILE TO LEGAL SERVICES FOR A HEARING, NO NEW EVIDENCE PROVIDED BY TAXPAYER. SEND FILE TO LEGAL SERVICES FOR A HEARING, CANNOT RESOLVE ALL ISSUES. TAXPAYER WITHDRAWS REQUEST FOR REDETERMINATION HEARING. Note that the third statement says 'cannot resolve all issues.' In these cases, the auditor will not amend or change the audit for those issues that can be resolved. They will simply be noted in the response. After all attempts by the auditor and pre-hearings process to resolve issues are exhausted, an audit will proceed to the hearings stage. This is still an in-house operation. At this point, the taxpayer may or may not be represented by an attorney. The audit will be assigned to an Assistant General Counsel attorney in the Administrative Hearings Section who will draft a position letter in response to the taxpayer's contentions. There are two types of hearings: a case may be presented orally or in writing. The actual hearing is presided by an Administrative Law Judge who works for the State Office of Administrative Hearings (SOAH). The oral hearing is a formal hearing where cases are presented, witnesses testify under oath and are examined and cross examined. An oral hearing will be held in Austin at the State Office of Administrative Hearings. The other hearing is based upon written submissions from each party in the case. The Administrative Law Judge bases the decision upon the case and testimony presented or on the written evidence submitted. A proposed decision is sent to both the taxpayer and Tax Administration Division within 30 days after the hearing or review of written submissions. If either side contests the decision, exceptions may be filed within 15 days. The other party has 15 days to respond to these exceptions. The Administrative Law Judge considers the exceptions and either amends the decision or issues a final decision. The Comptroller then signs the final decision. Prior to the hearing, the auditor will discuss the audit findings and points of contention with the attorney chosen to represent the Audit Division. At this time, the auditor will review the audit package and relate any additional documentation or comments to the attorney. The auditor should assume nothing. If the auditor believes an item to be germane to the issue at hand, it should be discussed. The auditor should appear professional in dress and manner at the oral hearing. The auditor should also keep in mind that the issues, not the auditor, are on trial. The auditor should be prepared to answer background questions as to experience as well as audit procedures chosen, records examined, why other alternatives were not used and why items were scheduled. At all times the responses should be kept factual. Any assumptions made by the auditor should be predicated by the thought process involved in reaching that assumption. The auditor will amend the audit per the hearings decision unless the Audit Division files exceptions. If the auditor feels strongly that the decision was incorrect, this should be discussed with the attorney representing Audit Division. Filing a lawsuit and attaching a copy of the protest letter to the original petition. This must be done within 90 days of payment. The lawsuit must be filed in the Travis County District Court. If the taxpayer originally initiates a refund request, and is not satisfied with the decision issued, he has 15 days after the decision to request a rehearing. If overruled, the taxpayer has 30 days to file in District Court. The case will be limited to issues raised in the motion for rehearing. At any time in this process, the taxpayer may agree with the audit or the audit can be amended at which time the process ceases. The Independent Audit Review Conference may be held at any time before turning the audit over to General Counsel for a hearing. However, only one conference with the Independent Audit Reviewer (IAR) may be held per audit. Up to 30 days from billing in most cases, 20 days if a Jeopardy Determination has been issued. Up to 90 days from payment date. Up to 15 days from decision rendering. Up to 30 days from rehearing motion denial.